At one time, astronomers believed the surface of Mars was crisscrossed by canal systems. This in turn gave rise to speculation that Mars was very much like Earth, capable of supporting life and home to a native civilization. But as human satellites and rovers began to conduct flybys and surveys of the planet, this vision of Mars quickly dissolved, replaced by one in which the Red Planet was a cold, desiccated and lifeless world. However, over the past few decades, scientists have come to learn a great deal about the history of Mars that has altered this view as well. We now know that though Mars may currently be very cold, very dry, and very inhospitable, this wasn’t always the case. What’s more, we have come to see that even in its current form, Mars and Earth actually have a lot in common. Between the two planets, there are similarities in size, inclination, structure, composition, and even the presence of water on their surfaces. That being said, they also have a lot of key differences that would make living on Mars, a growing preoccupation among many humans (looking at you, Elon Musk and Bas Lansdorp! ), a significant challenge. Let’s go over these similarities and the difference in an orderly fashion, shall we? In terms of their size and mass, Earth and Mars are quite different. With a mean radius of 6371 km and a mass of 5.97×1024 kg, Earth is the fifth largest and fifth most-massive planet in the Solar System, and the largest of the terrestrial planets. Mars, meanwhile, has a radius of approximately 3,396 km at its equator (3,376 km at its polar regions), which is the equivalent of roughly 0.53 Earths. However, it’s mass is just 6.4185 x 10²³ kg, which is around 10.7% that of Earth’s. Similarly, Earth’s volume is a hefty 1.08321 x 1012 km3, which works out 1,083 billion cubic kilometers. By comparison, Mars has a volume of 1.6318 x 10¹¹ km³ (163 billion cubic kilometers) which is the equivalent of 0.151 Earths. Between this difference in size, mass, and volume, Mars’s surface gravity is 3.711 m/s², which works out to 37.6% of Earths (0.376 g). In terms of their orbits, Earth and Mars are also quite different. For instance, Earth orbits the Sun at an average distance (aka. semi-major axis) of 149,598,261 km – or one Astronomical Unit (AU). This orbit has a very minor eccentricity (approx. 0.0167), which means its orbit ranges from 147,095,000 km (0.983 AU) at perihelion to 151,930,000 km (1.015 AU) at aphelion. At its greatest distance from the Sun (aphelion), Mars orbits at a distance of approximately 249,200,000 million km (1.666 AU). At perihelion, when it is closest to the Sun, it orbits at a distance of approximately 206,700,000 million km (1.3814 AU). 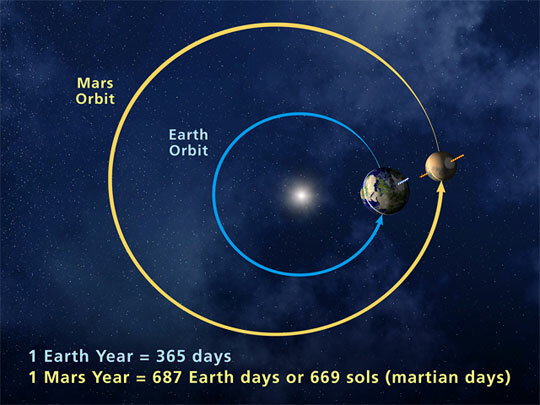 At these distances, the Earth has an orbital period of 365.25 days (1.000017 Julian years) while Mars has an orbital period of 686.971 days (1.88 Earth years). However, in terms of their sidereal rotation (time it takes for the planet to complete a single rotation on its axis) Earth and Mars are again in the same boat. While Earth takes precisely 23h 56m and 4 s to complete a single sidereal rotation (0.997 Earth days), Mars does the same in about 24 hours and 40 minutes. This means that one Martian day (aka. Sol) is very close to single day on Earth. Mars’s axial tilt is very similar to Earth’s, being inclined 25.19° to its orbital plane (whereas Earth’s axial tilt is just over 23°). This means that Mars also experiences seasons and temperature variations similar to that of Earth (see below). Earth and Mars are similar when it comes to their basic makeups, given that they are both terrestrial planets. This means that both are differentiated between a dense metallic core and an overlying mantle and crust composed of less dense materials (like silicate rock). However, Earth’s density is higher than that of Mars – 5.514 g/cm3 compared to 3.93 g/cm³ (or 0.71 Earths) – which indicates that Mars’ core region contains more lighter elements than Earth’s. Earth’s core region is made up of a solid inner core that has a radius of about 1,220 km and a liquid outer core that extends to a radius of about 3,400 km. Both the inner and outer cores are composed of iron and nickel, with trace amounts of lighter elements, and together, they add to a radius that is as large as Mars itself. Current models of Mars’ interior suggest that its core region is roughly 1,794 ± 65 kilometers (1,115 ± 40 mi) in radius, and is composed primarily of iron and nickel with about 16-17% sulfur. Both planets have a silicate mantle surrounding their cores and a surface crust of solid material. Earth’s mantle – consisting of an upper mantle of slightly viscous material and a lower mantle that is more solid – is roughly 2,890 km (1,790 mi) thick and is composed of silicate rocks that are rich in iron and magnesium. The Earth’s crust is on average 40 km (25 mi) thick, and is composed of rocks that are rich in iron and magnesium (i.e. igneous rocks) and granite (rich in sodium, potassium, and aluminum). Comparatively, Mars’ mantle is quite thin, measuring some 1,300 to 1,800 kilometers (800 – 1,100 mi) in thickness. Like Earth, this mantle is believed to be composed of silicate rock that are rich in minerals compared to the crust, and to be partially viscous (resulting in convection currents which shaped the surface). The crust, meanwhile, averages about 50 km (31 mi) in thickness, with a maximum of 125 km (78 mi). This makes it about three times as hick as Earth’s crust, relative to the sizes of the two planets. Ergo, the two planets are similar in composition, owing to their common status as terrestrial planets. And while they are both differentiated between a metallic core and layers of less dense material, there is some variance in terms of how proportionately thick their respective layers are. When it comes to the surfaces of Earth and Mars, things once again become a case of contrasts. Naturally, it is the differences that are most apparent when comparing Blue Earth to the Red Planet – as the nicknames would suggest. Unlike other planet’s in our Solar System, the vast majority of Earth is covered in liquid water, about 70% of the surface – or 361.132 million km² (139.43 million sq mi) to be exact. The surface of Mars is dry, dusty, and covered in dirt that is rich iron oxide (aka. rust, leading to its reddish appearance). However, large concentrations of ice water are known to exist within the polar ice caps – Planum Boreum and Planum Australe. In addition, a permafrost mantle stretches from the pole to latitudes of about 60°, meaning that ice water exists beneath much of the Martian surface. Radar data and soil samples have confirmed the presence of shallow subsurface water at the middle latitudes as well. As for the similarities, Earth and Mars’ both have terrains that varies considerably from place to place. On Earth, both above and below sea level, there are mountainous features, volcanoes, scarps (trenches), canyons, plateaus, and abyssal plains. The remaining portions of the surface are covered by mountains, deserts, plains, plateaus, and other landforms. Mars is quite similar, with a surface covered by mountain ranges, sandy plains, and even some of the largest sand dunes in the Solar System. It also has the largest mountain in the Solar System, the shield volcano Olympus Mons, and the longest, deepest chasm in the Solar System: Valles Marineris. Earth and Mars have also experienced many impacts from asteroids and meteors over the years. However, Mars’ own impact craters are far better preserved, with many dating back billions of years. The reason for this is the low air pressure and lack of precipitation on Mars, which results in a very slow rate of erosion. However, this was not always the case. Mars has discernible gullies and channels on its surface, and many scientists believe that liquid water used to flow through them. By comparing them to similar features on Earth, it is believed that these were were at least partially formed by water erosion. Some of these channels are quite large, reaching 2,000 kilometers in length and 100 kilometers in width. So while they look quite different today, Earth and Mars were once quite similar. And similar geological processes occurred on both planets to give them the kind of varied terrain they both currently have. Atmospheric pressure and temperatures are another way in which Earth and Mars are quite different. 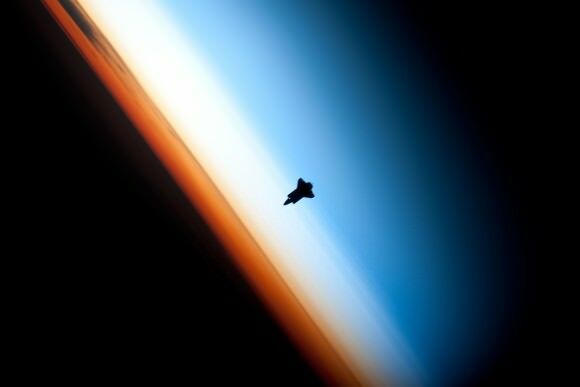 Earth has a dense atmosphere composed of five main layers – the Troposphere, the Stratosphere, the Mesosphere, the Thermosphere, and the Exosphere. Mars’ is very thin by comparison, with pressure ranging from 0.4 – 0.87 kPa – which is equivalent to about 1% of Earth’s at sea level. Earth’s atmosphere is also primarily composed of nitrogen (78%) and oxygen (21%) with trace concentrations of water vapor, carbon dioxide, and other gaseous molecules. Mars’ is composed of 96% carbon dioxide, 1.93% argon and 1.89% nitrogen along with traces of oxygen and water. Recent surveys have also noted trace amounts of methane, with an estimated concentration of about 30 parts per billion (ppb). Because of this, there is a considerable difference between the average surface temperature on Earth and Mars. On Earth, it is approximately 14°C, with plenty of variation due to geographical region, elevation, and time of year. The hottest temperature ever recorded on Earth was 70.7°C (159°F) in the Lut Desert of Iran, while the coldest temperature was -89.2°C (-129°F) at the Soviet Vostok Station on the Antarctic Plateau. Because of its thin atmosphere and its greater distance from the Sun, the surface temperature of Mars is much colder, averaging at -46 °C (-51 °F). However, because of its tilted axis and orbital eccentricity, Mars also experiences considerable variations in temperature. These can be seen in the form of a low temperature of -143 °C (-225.4 °F) during the winter at the poles, and a high of 35 °C (95 °F) during summer and midday at the equator. The atmosphere of Mars is also quite dusty, containing particulates that measure 1.5 micrometers in diameter, which is what gives the Martian sky a tawny color when seen from the surface. The planet also experiences dust storms, which can turn into what resembles small tornadoes. Larger dust storms occur when the dust is blown into the atmosphere and heats up from the Sun. So basically, Earth has a dense atmosphere that is rich in oxygen and water vapor, and which is generally warm and conducive to life. Mars, meanwhile, is generally very cold, but can become quite warm at times. It’s also quite dry and very dusty. When it comes to magnetic fields, Earth and Mars are in stark contrast to each other. On Earth, the dynamo effect created by the rotation of Earth’s inner core, relative to the rotation of the planet, generates the currents which are presumed to be the source of its magnetic field. The presence of this field is of extreme importance to both Earth’s atmosphere and to life on Earth as we know it. Essentially, Earth’s magnetosphere serves to deflect most of the solar wind’s charged particles which would otherwise strip away the ozone layer and expose Earth to harmful radiation. The field ranges in strength between approximately 25,000 and 65,000 nanoteslas (nT), or 0.25–0.65 Gauss units (G). Today, Mars has weak magnetic fields in various regions of the planet which appear to be the remnant of a magnetosphere. These fields were first measured by the Mars Global Surveyor, which indicated fields of inconsistent strengths measuring at most 1500 nT (~16-40 times less than Earth’s). In the northern lowlands, deep impact basins, and the Tharsis volcanic province, the field strength is very low. But in the ancient southern crust, which is undisturbed by giant impacts and volcanism, the field strength is higher. This would seem to indicate that Mars had a magnetosphere in the past, and explanations vary as to how it lost it. Some suggest that it was blown off, along with the majority of Mars’ atmosphere, by a large impact during the Late Heavy Bombardment. This impact, it is reasoned, would have also upset the heat flow in Mars’ iron core, arresting the dynamo effect that would have produced the magnetic field. Another theory, based on NASA’s MAVEN mission to study the Martian atmosphere, has it that Mars’ lost its magnetosphere when the smaller planet cooled, causing its dynamo effect to cease some 4.2 billion years ago. During the next several hundred million years, the Sun’s powerful solar wind stripped particles away from the unprotected Martian atmosphere at a rate 100 to 1,000 times greater than that of today. This in turn is what caused Mars to lose the liquid water that existed on its surface, as the environment to become increasing cold, desiccated, and inhospitable. Earth and Mars are also similar in that both have satellites that orbit them. In Earth’s case, this is none other than The Moon, our only natural satellite and the source of the Earth’s tides. It’s existence has been known of since prehistoric times, and it has played a major role in the mythological and astronomical traditions of all human cultures. In addition, its size, mass and other characteristics are used as a reference point when assessing other satellites. The Moon is one of the largest natural satellites in the Solar System and is the second-densest satellite of those whose moons who’s densities are known (after Jupiter’s satellite Io). Its diameter, at 3,474.8 km, is one-fourth the diameter of Earth; and at 7.3477 × 1022 kg, its mass is 1.2% of the Earth’s mass. It’s mean density is 3.3464 g/cm3 , which is equivalent to roughly 0.6 that of Earth. All of this results in our Moon possessing gravity that is about 16.54% the strength of Earth’s (aka. 1.62 m/s2). The Moon varies in orbit around Earth, going from 362,600 km at perigee to 405,400 km at apogee. And like most known satellites within our Solar System, the Moon’s sidereal rotation period (27.32 days) is the same as its orbital period. This means that the Moon is tidally locked with Earth, with one side is constantly facing towards us while the other is facing away. Thanks to examinations of Moon rocks that were brought back to Earth, the predominant theory states that the Moon was created roughly 4.5 billion years ago from a collision between Earth and a Mars-sized object (known as Theia). This collision created a massive cloud of debris that began circling our planet, which eventually coalesced to form the Moon we see today. Mars has two small satellites, Phobos and Deimos. These moons were discovered in 1877 by the astronomer Asaph Hall and were named after mythological characters. In keeping with the tradition of deriving names from classical mythology, Phobos and Deimos are the sons of Ares – the Greek god of war that inspired the Roman god Mars. Phobos represents fear while Deimos stands for terror or dread. Phobos measures about 22 km (14 mi) in diameter, and orbits Mars at a distance of 9,234.42 km when it is at periapsis (closest to Mars) and 9,517.58 km when it is at apoapsis (farthest). At this distance, Phobos is below synchronous altitude, which means that it takes only 7 hours to orbit Mars and is gradually getting closer to the planet. Scientists estimate that in 10 to 50 million years, Phobos could crash into Mars’ surface or break up into a ring structure around the planet. Meanwhile, Deimos measures about 12 km (7.5 mi) and orbits the planet at a distance of 23,455.5 km (periapsis) and 23,470.9 km (apoapsis). It has a longer orbital period, taking 1.26 days to complete a full rotation around the planet. Mars may have additional moons that are smaller than 50- 100 meters (160 to 330 ft) in diameter, and a dust ring is predicted between Phobos and Deimos. Scientists believe that these two satellites were once asteroids that were captured by the planet’s gravity. The low albedo and the carboncaceous chondrite composition of both moons – which is similar to asteroids – supports this theory, and Phobos’ unstable orbit would seem to suggest a recent capture. However, both moons have circular orbits near the equator, which is unusual for captured bodies. So while Earth has a single satellite that is quite large and dense, Mars has two satellites that are small and orbit it at a comparatively close distance. And whereas the Moon was formed from Earth’s own debris after a rather severe collision, Mars’ satellites were likely captured asteroids. Okay, let’s review. Earth and Mars have their share of similarities, but also some rather stark differences. In short, compared to Earth, Mars is a pretty small, dry, cold, and dusty planet. It has comparatively low gravity, very little atmosphere and no breathable air. And the years are also mighty long, almost twice that of Earth, in fact. However, the planet does have its fair share of water (albeit mostly in ice form), has seasonal cycles similar to Earth, temperature variations that are similar, and a day that is almost as long. All of these factors will have to be addressed if ever human beings want to live there. And whereas some can be worked with, others will have to be overcome or adapted to. And for that, we will have to lean pretty heavily on our technology (i.e. terraforming and geoengineering). Best of luck to those who would like to venture there someday, and who do not plan on coming home! We have written many articles about Mars here on Universe Today. Here’s an article about how difficult it will be to land large payloads onto the surface of Mars, and here’s an article about the Mars methane mystery. And here are some on the distance between Earth and Mars, Mars’ gravity, and if humans can live on Mars. Nit pick? “…meaning that ice water exists beneath much of the Martian surface.” S/B “water ice”? Great overview! If anything can be added, and if I get it right, it would be the difference in mineral diversity. There are about 4000 different minerals on Earth’s surface but just a tenth of that on Mars. This because of biology, mainly by putting oxygen in the atmosphere. The Solar System is a small sample of worlds, but it seems enough to conclude that Earth isn’t a freaky outlier. The other rocky planets and Ganymede (magnetic field) and Titan (atmosphere) all have bits and pieces of what it takes to make an Earth. Plate tectonics doesn’t seem to be common, but historically at least some icy moons have had even that kind of process. Heads up – lose the extra ‘t’ appended to ‘though’ in the second p/graph.